Heat the oil in a large or paella pan and cook the onion, garlic and chilli for 2 minutes until soft but not coloured. Stir in the chicken and cook for 3-4 minutes. Add the chorizo, peppers and rice, stir well until coated all the ingredients, especially the rice, are all coated with the oil. Gradually add stock, a ladle full at a time. Stir, and cook until the stock is absorbed before adding more stock. Add saffron whilst rice is cooking. Stir in the broad beans and peas. 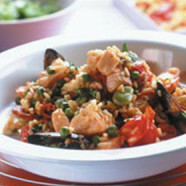 Set the salmon pieces, prawns and mussels amongst the cooking rice. Cover to allow fish to steam for 5 to 7 minutes. Stir in half the chopped coriander. Cook’s Tip:To prepare mussels, rinse in cold water & remove the ‘beard’ (piece of fibre hanging from the shell) with a gentle pull. Discard any mussels that are already open unless they close when tapped gently on a firm surface.